Tiger takes you to discover the most impressive and fascinating reefs in Cozumel. The tour stops in several secret places where no other snorkeling-tour operator will take you and ends in El Cielo Cozumel…. paradise! Tiger’s Snorkel & Cielo Party Tour takes you much further than other snorkel tours in Cozumel. You won’t find any other Cozumel snorkel tour around our private reefs by El Cielo, because others only take you around the cruise piers or from the shore so they can make more money. They dont want to waste money on gas and their snorkel tours are only 2 hrs compared to our whopping 4-41/2 hr tour, which gives us time to take you much further, to the best reefs in Cozumel Mexico. 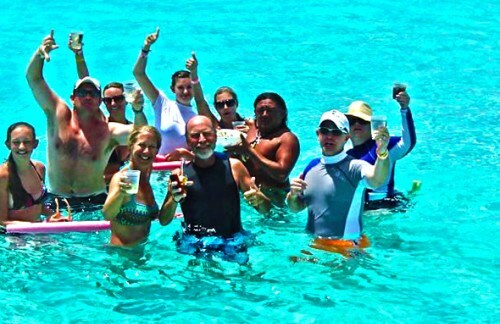 After snorkeling in Cozumel with our top rated snorkel guides, you’ll get to drift away and party with our snorkel crew in El Cielo. El Cielo means “Heaven”, and is the most spectacular location in the Caribbean Sea. It´s very shallow and is located right off of Cozumel in the center of the Caribbean. It is only accesible by boat, and we have a special boat that can take you to the most shallow spots of El Cielo. The water is only 3-4 ft as far as you can see, with powder white sand that massages your feet. El Cielo is filled with starfish and stingrays that can be seen from yards away because of the crystal clear waters. Your guides will provide you with their famous guacamole, ceviche, fresh fruits, and other snacks. You will also have your choice of ice cold beer and drinks, water, soda and more all included. This is such a beautiful experience be sure not to miss it during your vacation in Cozumel. Many people come back year after year to experience the best tour in Cozumel. Just sit back and enjoy while Tiger entertains you with his stories. Make sure you book in advance here at the hotel as there is only limited availability.